The Detroit-Superior Bridge is a two story, historic work of art in the city of Cleveland. It forms one of the major connections between Ohio City and the Cleveland’s downtown district. Although the bridge is very striking in its appearance, it lacks a sense of unity between the top and bottom layers. The upper level consists of mostly vehicular traffic while the lower level will have an emphasis on pedestrian circulation. There are currently no ways to travel between the two levels and because the bridge is so long, it forces users into a feeling of seclusion. 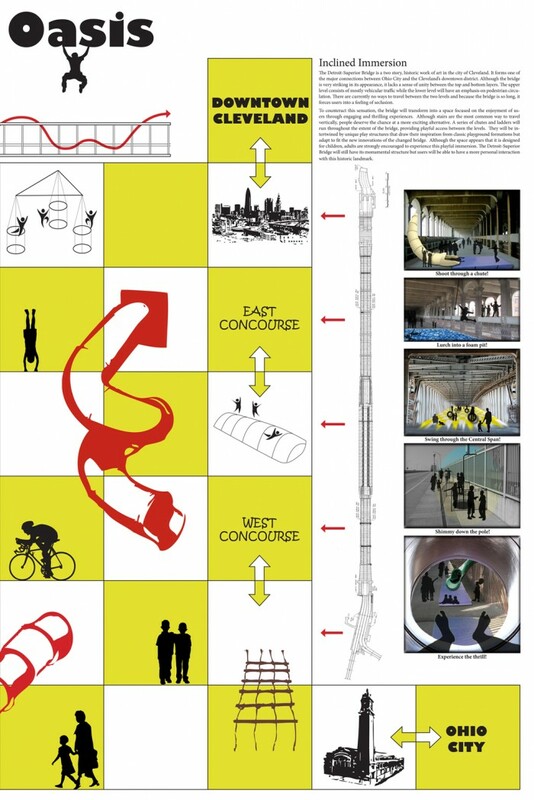 To counteract this sensation, the bridge will transform into a space focused on the enjoyment of users through engaging and thrilling experiences. Although stairs are the most common way to travel vertically, people deserve the chance at a more exciting alternative. 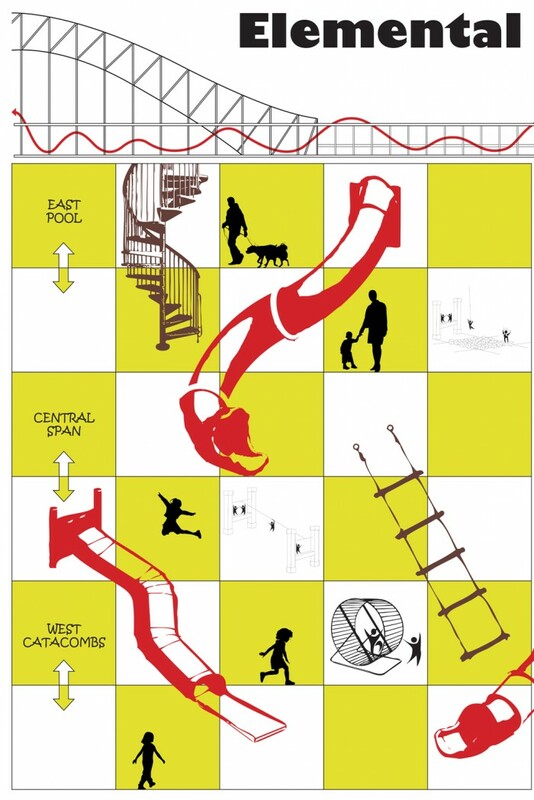 A series of chutes and ladders will run throughout the extent of the bridge, providing playful access between the levels. 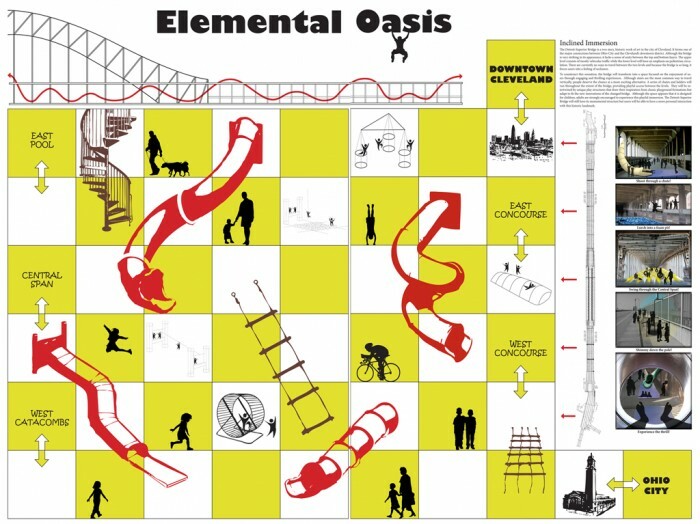 They will be intertwined by unique play structures that draw their inspiration from classic playground formations but adapt to fit the new innovations of the changed bridge. Although the space appears that it is designed for children, adults are strongly encouraged to experience this playful immersion. The Detroit-Superior Bridge will still have its monumental structure but users will be able to have a more personal interaction with this historic landmark.